Started a You tube channel, here are the links to various videos. This code instruction is for V 2.4 of the code and will be updated as we develop new code. It has full discharger support, for cycling, pulse Internal resistance testing, and high current IR test( not released yet). The user interface is much more intuitive for the user, includes the new option bit setup which is so much simpler than V 1.2. This version requires that you have upgraded your chargers hardware to include the mew 18F4620 microcontroller, and has the AUX port connector installed. Step by step install of a grid charger harness in the second generation Honda Civic. 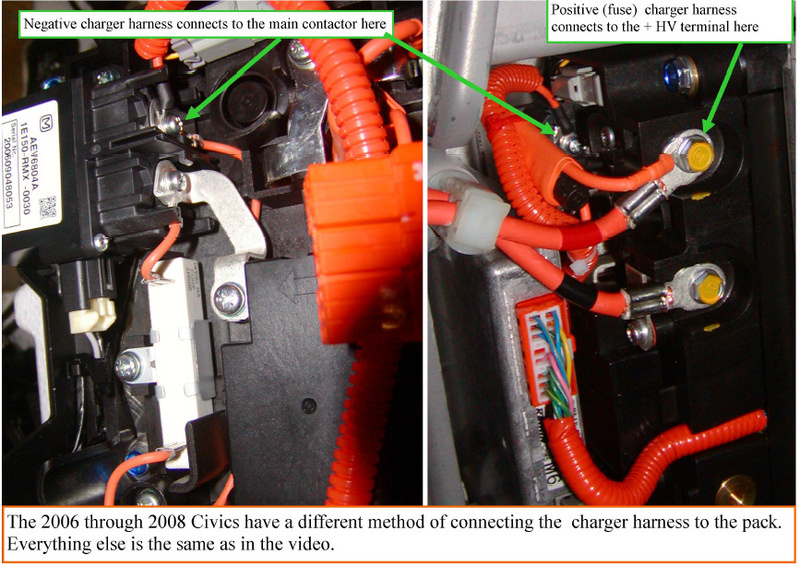 Note that the 2006 through 2008 civic may have a different HV connector board from what the video shows. Please refer to this photo for the correct + and - connection points. Many people assemble the discharger incorrectly, so Jessica demonstrates how to insert the bulbs and test the discharger to confirm operation. If I send you a new chip with new software. this video shows how to disassemble the charger and swap the chip. It also shos how to upgrade an earlier charger that does not have the AUX connector. Here we get into operating the datalogger. Save the back, and have good control of the inserting and removal of the battery pack. When the charger no longer can keep your pack operational, it can be used to determine the low capacity subpacks by looking at the sequence that they drop out when discharging.